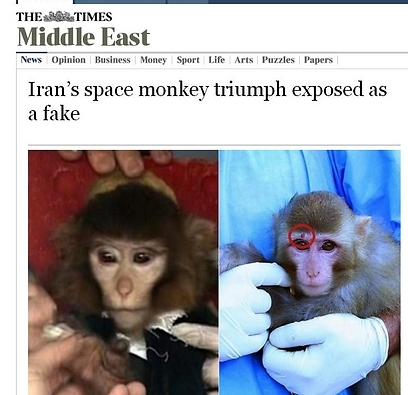 Iran monkey space launch fake? Just four days after Iran proudly announced it had successfully launched a monkey into space – a move seen as proof of a technological breakthrough which may help the Islamic Republic advance its nuclear program, London’s Times newspaper is questioning the Iranian claims. The British paper said Friday that two different photographs of the monkey allegedly sent to space raise suspicion that the launch never happened at all or that the original monkey died during the flight and the Iranians introduced a different monkey to announce their triumph…. “It is manifestly a different creature,” the Times said. So, do monkey martyrs get 72 virgin monkeys, in heaven? Assuming it was a male monkey, of course. Where do you think they get the virgins ? Why Iran has NEVER used BAD photo-shopping for propaganda purposes…. Their “space” program is beyond reproach. Why would anyone assume otherwise? That’s not a monkey, it’s ahmadinejad’s little brother. You beat me to it. I thought it was Ahmadinejad and his brother. BTW, why are the Iranians sending Jews and Christians into space? Why so kind to us? Monkey in space? Big deal. — We’ve had two monkeys as Secretary of State in just the past four years. Iran can’t even pull off a fake space launch. Maybe it was affected by cosmic rays and started mutating. Hey, if they can give the Fantastic Four super-powers, they can mess up a monkey big-time. I know the mad mullahs are lying perverts, but this is a monkey. I mean, what kind of low-life lies on a monkey? I copied the headline, entered it into Google, and this is what I got. I did it solely to show the sad eyed monkey, that it’s no laughing matter. You might say Iran has gone ape over its fake monkey. So the monkey is fake? What difference does that make now? I don’t know whether to buy it or not. Obama is manifestly a colossal douche. Riding on a pig, baby monkey! Backwards on a pig, baby monkey! *Do NOT listen to this cutesy YouTube video unless you want a mindless ditty stuck in your brain for the next several weeks. Is this the latest hot nursery rhyme in Gaza? Those two are not even related. Different nose,different ears, different eye socket shape. Idiots can’t even prepare to cover for problems.